There’s a lot of excitement around Android’s latest version called Jelly Bean. Bundled with Nexus 7 tablet computer, this update brings along many new exciting features to Android phones. Competing head-on with Apple’s upcoming iOS 6, this shiny new Android version is making waves across the mobile community. However, while Apple’s iOS and the Droid are at loggerheads, attacking each other with patent claims and what not, Microsoft’s dream OS, that is Windows Phone 8 is slowly catching up with them. Though not even half as popular as iOS, or even Android for that matter, Windows Phone 8 does offer some promising features. Moreover, its gorgeous UI and simplicity makes it a great alternative to Android and iOS. That said, is it good enough to take on Android? Will Windows Phone 8 be Microsoft’s secret weapon against Android Jelly Bean? Let’s compare them head-to-head and find out for ourselves. Android takes up a significant amount of the smartphone market as compared to Windows. Though Microsoft is slowly growing, its growth is nothing compared to the success Android enjoys. 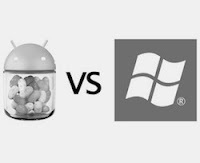 Therefore, it goes without saying that Jelly Bean is already considered as one of the most popular Android versions around. Windows Phone 8 on the other hand, doesn't get that much attention. However, Windows fans, which we’re sure there are millions of them, might flock to this new attraction as it’s based on the same technology as Windows 8. Also, Windows Phone 8 sales might not actually pick up until Windows 8 OS comes along. If, somehow, Microsoft comes up with a strategy to market their smartphones to Windows 8 owners, we might see some real competition. Other than that, despite being so good, Windows Phone 8’s success is quite unlikely given Android’s current dominance. For Android users, the Google Play Store offers a great variety of apps. From popular magazines to thumb-tapping games, there’s barely anything that Droid users can’t get from there. However, that doesn't mean that Windows Phone Marketplace is far behind. Growing slowly and steadily, Microsoft’s stock of mobile apps seems to be catching up with Google. In June 2012, Windows Phone Marketplace reached a whopping 100,000 apps, a growth that is even faster than what we saw on Android. The Play Store, however, sails smoothly with 600,000 apps in its repertoire. If you’re an Android or an iOS user switching to Windows Phone, you won’t have much trouble finding your favorite apps. Most of the popular applications like WhatsApp, Yelp, Kindle, Skype, Flixter, Vogue etc. are already there in Windows Marketplace. If, however, you were looking for obscure games, or even big apps like Instagram and Flipboard, you’d be disappointed. Summing up, despite the lack of many apps in the Windows Marketplace, it does offer a great selection of software, which might not be a big hurdle for anyone switching from iOS or Android to Windows Phone 8. Moreover, the Android Play Store has repeatedly become a victim of malware and viruses, a problem that the Windows Store doesn't suffer from. Having said that, the Android Play Store is still the leader in this department. Though Android’s new Jelly Bean UI promises a buttery smooth experience, Microsoft’s constantly updating tiled UI manages to impress even those who hate Redmond. 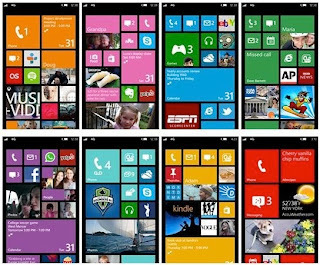 The most catchy thing about Windows Phone 8 is that it improves upon the Windows Phone 7 UI and allows users to customize their tiles according to their needs. So, if you are into messages, you can expand the messaging tile to make sure you are constantly updated about incoming messages. Also, you can have custom tiles for people who are close to you making the whole experience amazingly personal. Android’s Jelly Bean on the other hand promises a buttery smooth navigation along with a UI that is quite familiar to Droiders. Also, there are the new resizable widgets that make the interface even more customizable. Overall, it’s not that Android has an ugly interface or something; it’s just that it is not as intuitive and simple as Windows Phone 8. For sheer simplicity and ease of use, Windows Phone 8 wins this round. Both Android and Windows Phone 8 comes with some great navigation capabilities. Both support offline caching and either of them can get you out of a bad traffic jam. That said, Google Maps integration with the rest of Google’s services is something that Nokia Maps can never be able to outmatch. Despite Google Maps for Android winning the round, I’d say it’s still a close competition between the two. 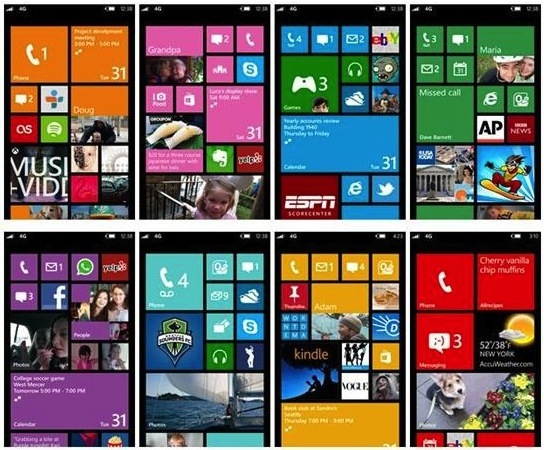 Windows Phone 8 is a completely new technology and it won’t run on existing Windows 7 smartphones. So, if you’re using a Windows 7 phone, you won’t get updated to Windows Phone 8. Instead, you’ll get the Windows 7.8 update that will bring some of the essential features of the new version whilst holding back features, which your phone doesn't support. According to Microsoft developers, with the 7.8 version update, your smartphone will look and feel like a Windows 8 Phone but it won’t have all the advanced features like NFC that your phone doesn't support yet. 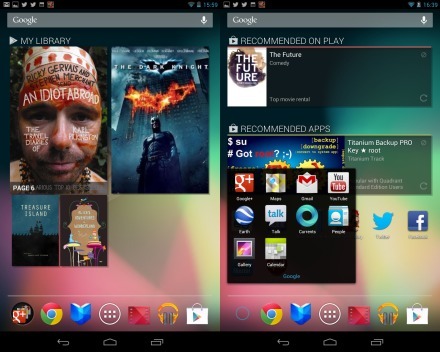 Jelly Bean on the other hand is available to only a few users. If you’re a Galaxy Nexus or a Nexus S user, you’re lucky; otherwise you’d have to wait a while. 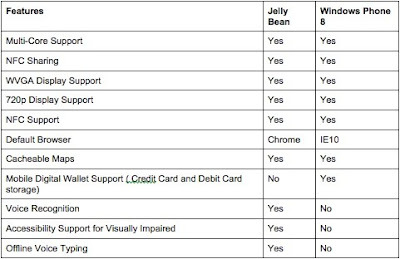 Similar to what we see in the Windows Phone OS roll out, Nexus S users won’t get all the Jelly Bean features. In fact, when my Nexus S got updated to Android 4.0 (Ice Cream Sandwich), the Face Unlock feature was not included as my phone was too slow to run it. Overall, with the select number of users being able to see the update, this makes Windows Phone 8 the winner in this department. Microsoft has always been the first choice of enterprise customers. And, Windows Phone 8 makes sure that its IT-savvy crowd doesn't switch to Android or iOS. With features like BitLocker Drive Encryption, secure boot, and IT management, Windows Phone 8 scores in a department where it has always dominated. Moreover, there’s also the Company Hub feature that allows companies to have independent app distribution. Though games like Temple Run and ShadowGun have won over many Android fanboys and fangirls, it’s not as good a platform as iOS is for gaming. Windows Phone 8 however goes one step ahead and promises an even bigger gaming experience for its users. Windows Phone 8 will support gaming middleware like Havok Vision Engine, Autodesk Scaleform, Audiokinetic Wwise, and Firelight FMOD, and also native DirectX-based game development. Thanks to this, developers can port PC games directly to Windows Phone 8 without hassles. Also, Xbox being an established gaming platform will make Windows Phones even more popular among gamers. Though both Android and Windows Phone 8 are yet to catch up in this department, we’d still give one point to Windows Phone 8 simply because it looks really promising as a gaming platform. Overall, both Windows Phone 8 and Jelly Bean are solid mobile operating systems. They are powerful, fast and catching up really quick with iOS. 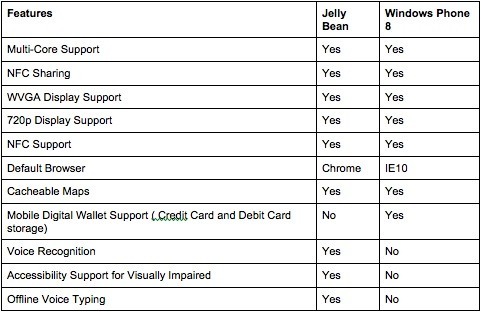 That said, when compared head-to-head, there are many departments in which Jelly Bean simply steals the show. Also, Android’s ever-surging popularity makes it a complete winner in this one-sided battle. But it would be too early to dismiss Windows Phone 8; it’s simplicity, power, and compatibility with other Microsoft products might make it a dark horse in the battle for mobile supremacy. I'm sorry, but the usability and security are the things which matter the most, and that is why Android is a sure loser. Also, after Digital Wallet support, you don't need a analog wallet anymore, which is yet another thing I would not touch Android. In enterprise comparison, you totally forgot the integration support for Microsoft based enterprise systems. How many SECURE enterprise systems Google provides, and how many enterprises are actually using them? The law of simplicity: More is not necessarily better. Jelly Bean - lots of useless features. Its funny how the new iphone 5 incorporates aspects of android... take a picture while video recording, panoramic mode... LTE, all feature in android and have done for a year now.